FilmFixer congratulates the production team on Woody Harrelson’s Lost in London, for winning this year’s Production Team of the Year Award. The trophy will be handed out tomorrow night (Sat, Sep 22nd) at The Production Guild awards, held at The Grove in Hertfordshire. Shot in one take and transmitted live to audiences across the US and one UK cinema, Woody Harrelson’s directorial debut was also a first in movie history. In the film, Camden’s West End plays Soho. To make it possible, the production team worked closely with Camden Film Office, ensuring local residents were consulted, respected and engaged. In addition, the production made generous, impactful donations to many local charities and residents groups. FilmFixer manages Camden Film Office. FilmFixer’s CEO Karen Everett says, “This was an important cinematic event – and yet the filming itself was extremely low key. For a production with an impact on the history of film, it made very little impact, if any, on the streets, during filming. “There was no cabling or equipment in the streets, there were no generators or lights or noise, and no crew on the streets except one camera and the relevant cast members. It was hard to believe this was a production starring Hollywood actors. “Each outside shot lasted no more than fifteen minutes. “Local businesses supported the effort in many ways. A creative agency based in area came up with lighting designs and window dressing to give their frontage a buzzy London West End feeling. “And businesses opened their doors as locations. A studio called IceTank, described as ‘plain white but it in the right place’, was turned into the French restaurant where Woody Harrelson meets his wife and leaves 15 minutes later, after things go wrong. Woody Harrelson, Director/Producer has said, “I want to congratulate everyone who worked on Lost in London on this Production Guild Award. There were so many obstacles that seemed almost insurmountable. The concept of shooting in real time was crazy enough but to live broadcast as we shot it; well, some people called it insane and I did think the same myself on a number of occasions! The first film ever to be broadcast live, Lost in London was shot in a single take with one camera over 100 minutes and starred Harrelson, Owen Wilson and Willie Nelson. Featuring a cast of 30, more than 250 supporting artists and 260 crew, filming began in London at 2am on 20 January 2017 and was broadcast live across more than 550 US cinemas and one UK screen. 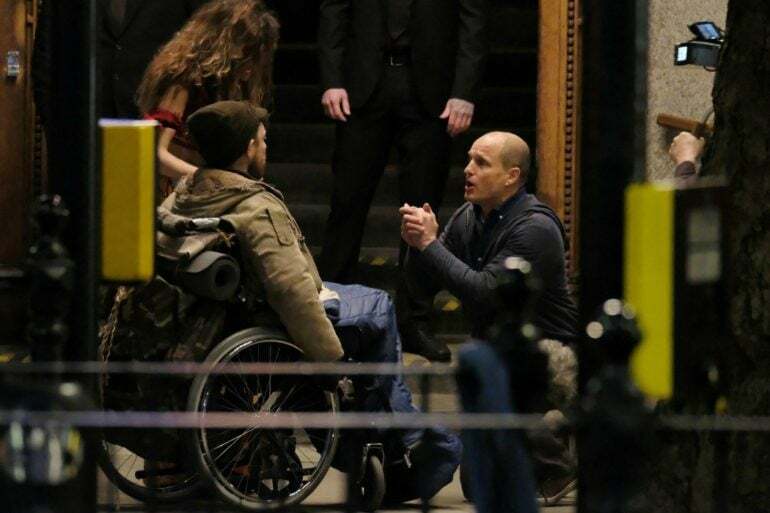 In the film Woody Harrelson leaves the Shaftesbury Theatre stage door on Grape Street, and walks to the restaurant on the same street with his assistant. When he leaves, he gets into a taxi, drives along Bloomsbury Way and Vernon Place and stops outside Old Central St Martins building for the nightclub scene. About thirty minutes later, Harrelson gets into a taxi on the corner of Southampton Row. He argues with the taxi driver, gets out and tries to escape across Bloomsbury Park. But he’s arrested and taken to the police station set in Old Central St Martins via Fisher Street. On the eve of the shoot, location manager David Broder spoke to FilmFixer. A Camden resident himself, David explained how he and Woody Harrelson arrived at the decision to film in the London Borough of Camden. “They outlined the story and what they were trying to do. I thought okay this is crazy but interesting,” he said. “Woody Harrelson came over… At that stage it was one camera, one take… We looked at real restaurants, real nightclubs, lots of the West End theatres. “That was with Woody and it took a few weeks to realise that actually to technically do it we needed to set up in one place – which is the old Central St Martins building, where we could have two big sets – our nightclub and a police station setting in the basement, and make that our base. “Around that time in October the live broadcast idea started to come into the mix, which made it even more complicated and technically it had never been done before. “Here we are in January and we’ve managed to pull it off. We’ve managed to get permissions for all the locations from the council authorities, the police, Transport For London. Also technically being able to get RF (radio frequency) aerials, transmitters on rooftops, which at last count was 47, that takes a huge amount of work and a lot of cable. Applying some brilliant understatement he agreed, “It’s quite an unusual project,” while adding that working with Woody Harrelson has been a great experience. David explained how the film was based on a real incident in Woody Harrelson’s life: “He was in a play in the West End and he leaves the theatre, goes to a restaurant very close by to meet his wife who’s come in from the States to see him. “But she’s read a newspaper article where he’d got in trouble with the paparazzi and some scantily clad women in a nightclub with Owen Wilson. “He ends up in a nightclub and meets Owen Wilson again, which turns into a fight… He gets in a taxi… the taxi driver realises Woody has left his wallet behind… so they get into a big argument.